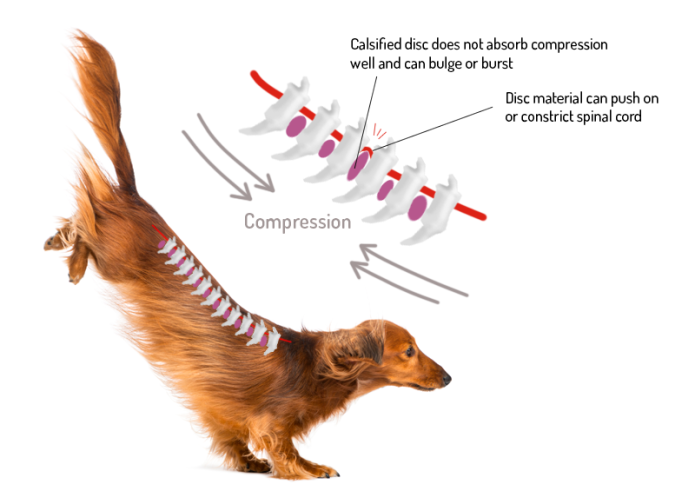 IVDD (intervertebral disc disease) is a condition that affects about 25% of dachshunds as well as some other breeds, especially those with longer backs. Our bodies have little discs between our vertebrate – sort of like jelly-filled donuts - that act as cushions between the vertebrae. IVDD is when these discs become susceptible to bursting over time as the outer fibrous layer hardens and loses its elasticity. Burst or bulging discs usually occur from hard impacts or injury, like from wrestling, jumping off or over things, doing stairs, etc. The offending disc can push on nerves or the spinal cord itself, causing severe pain and in some cases, paralysis. This is why it is so important to ensure that a dog prone to IVDD avoids repetitive or hard landings from jumping off furniture or doing stairs. It’s always best if you can prevent a disc from bulging/bursting in the first place, because recovery is long and hard, and if paralysis occurs, surgery is usually the recommended course of action, which is very costly and stressful. Keep your dog strong! A strong back puts less stress on the discs themselves to absorb impacts. Don’t let your dog do stairs! Here at Crusoe’s house, we have baby gates set up at the top and bottom of all staircases. Crusoe underwent spinal surgery for a blown disc in August 2016 after he had gone "wobbly" in the back legs. It was a long, hard recovery process that we never want to go through again. I know the DoggoRamp will not only add convenience to people's lives, but help prevent other dog families from going through what we did.